Josh Krales, the whiskey-sodden but irrepressible reporter-hero of ONE DEAD DEBUTANTE, returns in the most sensational and dangerous adventure of his career. 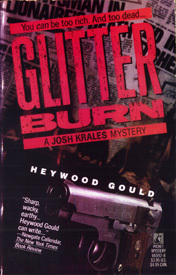 GLITTERBURN is the title of the book, and the name given to an inspired terrorist plot to blackmail the country’s richest men into donating their fortunes to the cause—or suffer the consequences. The trail of bodies leads Josh from his office at the New York Event across the continent to Hollywood, where he finds both danger and what he believes is true love in an enclave of pleasure-seeking children of the movie industry. Here in Hollywood, Krales finds a cataclysm of depravity and destruction that almost halts his ceaseless flow of wisecracks once and for all.